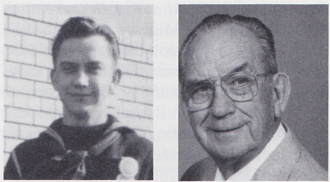 Robert N. "Checko or Squirrely" Erlandson, Electrician's Mate 2/c, born Nov. 13, 1922, Osakis, MN; enlisted in the Regular Navy for a six year hitch April 24, 1941; went to Great Lakes NTC, Co. 41, then to Aviation Machinist Mate School in Chicago. He was then assigned to the PBY Sqdn. (VP-23) at Ford Island in Pearl Harbor. He was in the Midway battle, then asked for a transfer out of aviation. He was assigned to the USS West Virginia on June 26, 1942; participated in the Midway Battle, all the Philippine battles, Surigao Strait Battle, Iwo Jima, Okinawa and guarded the USS Missouri at the Tokyo Bay signing. Also served aboard the West Virginia until it was put in moth balls at Pier 40, Seattle, WA. Transferred to keep the yard tug boats at Bikini Atom bomb tests in electrical running condition. 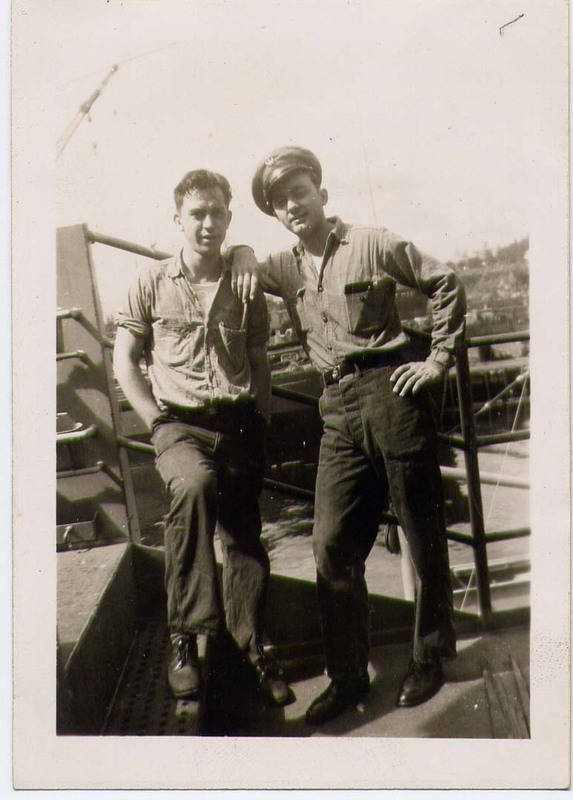 Discharged on April 24, 1947, and followed the trade he learned aboard the West Virginia. He attended the University of Minnesota then joined the International Brotherhood of Electrical Workers Local 110, went through their apprenticeship and worked for contract shops holding positions of journeyman, foreman, gen. foreman and superintendent at jobs from Missouri to Colorado. Retired in 1985. He and is wife, Gladys, have four children living, one son passed away at young age, four grandchildren and one great-grandchild. He enjoys Minnesota casinos, fishing and traveling. He has osteo arthritis, so his usual sports of skating, skiing, tennis, bowling, etc., are passe.